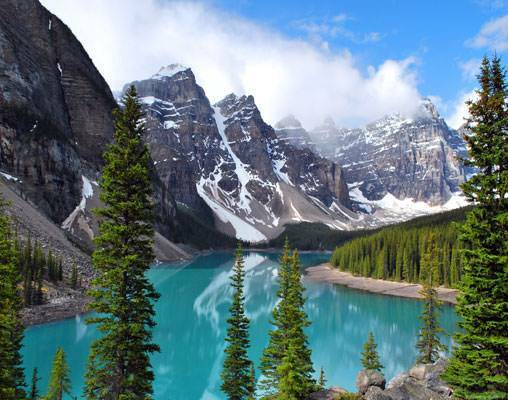 Set your sights on the scenic beauty of Canada’s western seaboard and the wild adventures of the Canadian Rockies on this 13-day journey. Extended for a limited time! Save 5% on qualifying Canada rail vacations. Book by April 30 and use promo code CAN19. Make 2019 the year for your Canada rail vacation and take advantage of this limited time only exchange rate savings promotion. Offer is valid for new bookings only made between April 8, 2019 and April 30, 2019, for travel in 2019. Offer has no cash value and is non-transferable. Not available on Group Travel. Not available on Rail & Cruise vacations. Offer is subject to availability and may be modified or withdrawn at any time. Additional terms and conditions may apply. 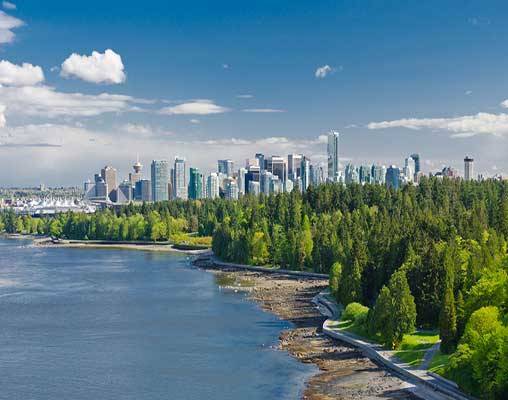 By boat, train and plane, see some of the best sights western Canada has to offer on this exciting tour. You will spend time in the great city of Vancouver and enjoy some of the surrounding island locales, such as Port Hardy and Prince Rupert. Moving back to mainland Canada, places such as Prince George, Jasper, Lake Louise and Banff lie ahead. In each destination, you can look forward to guided adventures and independent exploration. You will do things like embark on tours to see whales and grizzly bears; explore amazing natural sites; sightsee through big cities and quaint villages; and experience Canada in a whole new way. Coastal British Columbia and mountainous Alberta: Two vastly different Canadian locations in 13 adventure-filled days. Arrive at Vancouver International Airport, collect your luggage and meet your driver for a private transfer to your centrally located hotel for the first of three nights. The rest of the day is free to explore the city’s sites and dining scene. Overnight Vancouver. A grand adventure through British Columbia lies ahead on a day trip along the Sea to Sky Highway. This all-day excursion will take you to Shannon Falls, where you will observe the third tallest waterfall in British Columbia spilling water into sparkling pools below; the Sea-to-Sky Gondola in Squamish, which offers dramatic views over Howe Sound and access to a lodge, hiking trails and a suspension bridge; and the Britannia Mine Museum, a place where 19th century gold mining comes to life as you descend into some of the remaining caverns. After your visit to the mines, stop in Britannia Beach, a historic mine town, before returning to your hotel. Overnight Vancouver. Depart Vancouver Harbour by seaplane for an exciting flight over the Gulf Islands en route to Victoria. Enjoy a coach tour to the Victoria Butterfly Gardens and the world famous Butchart Gardens before arriving in downtown Victoria. Take some time to shop, sightsee, and stroll along the inner harbour before your return flight. Overnight Vancouver. This morning, a private car will pick you up at your hotel and transfer you to Vancouver’s airport. This is not just any flight you are setting out upon; rather, you will be making your way to Port Hardy on Vancouver Island via floatplane. This flight is completed in just over an hour, leaving ample time to get acquainted with this island locale upon arrival. You will transfer to your hotel independently as you land, and because the Kwa’Lilas Hotel is located in the city center and within minutes of the waterfront, there is plenty for you to experience after check-in. Overnight Port Hardy. Ahoy! 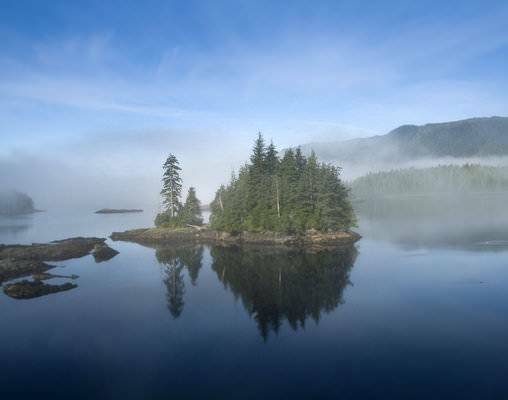 You are in for a day of cruising and coastal wonders as you sail through the Inside Passage en route to Prince Rupert. You will transfer to the waterfront on your own and then board your cruise liner for this exciting journey. This 15-hour tour covers 274 nautical miles along the West Coast of Canada and features one scenic stop to enhance the tour experience. Along the way, keep your eyes peeled for harbor seals, gray and humpback whales, orcas and otters out on the water; eagles above; and moose, caribou and bears on the surrounding shorelines. The ship’s captain will make announcements as points of interest come into view, so you can take in all the best sights the Inside Passage has to offer. As you arrive in Prince Rupert, transfer to your hotel for the first of two overnights. Overnight Prince Rupert. Have a look around Prince Rupert as you make your way to the train station to board your VIA Rail train bound for Prince George. The train will depart from the station this morning, and you will spend the day looking over British Columbia’s changing landscape. You will watch as the ocean and shoreline fade into the distance and mountains and forests come into view. Moving further inland, vast grassy plains provide yet another look at the landscape. You can look forward to a route along the Skeena River and through the Skeena Valley, into Kitselas Canyon and Tunnels, past the Seven Sisters mountain range, through the route’s longest tunnel in Bulkley Canyon and past beautiful lakes en route. As your train arrives in Prince George, you will transfer to your hotel for the evening. Overnight Prince George. Head back to the train station this morning and board your VIA Rail train for a ride into the Canadian Rockies to the town of Jasper. The train’s route will take you across the Hansard and Rausch River Bridges, past Mount Robson and over Yellowhead Pass at the Continental Divide as the train crosses between British Columbia and Alberta. You will be surrounded by the dramatic peaks of the Canadian Rockies as you approach Jasper. Keep a lookout for wildlife, including wolves, caribou and moose, as you approach the station. As the train arrives, transfer to your hotel, the iconic Fairmont Jasper Park Lodge, with the remainder of the evening to enjoy Jasper and the surrounding national park. Overnight Jasper. Take the reins on your adventure as you pick up your rental car. With unlimited mileage, you will have the freedom to explore the park, the mountains and the surrounding region. 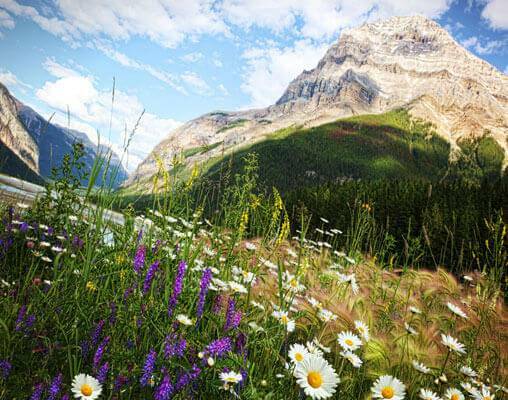 Begin your independent adventures with a look at Jasper and Jasper National Park. Perhaps take a drive out to Maligne Canyon and Lake, ride aboard the Jasper Skytram or get in touch with nature on one of the many hiking trails. Early this evening, set out for the Wildlife Discovery Tour. Over the course of 3 1/2 hours, you will learn about the flora and fauna of the region, as well as see animals such as wolves, big horned sheep, mountain goats, moose and bears. Your professional guide will provide interesting tidbits about the animals, their habitats and the steps taken to ensure a balance between animals and humans. Overnight Jasper. Depart Jasper today following a scenic route down Icefields Parkway towards Lake Louise. 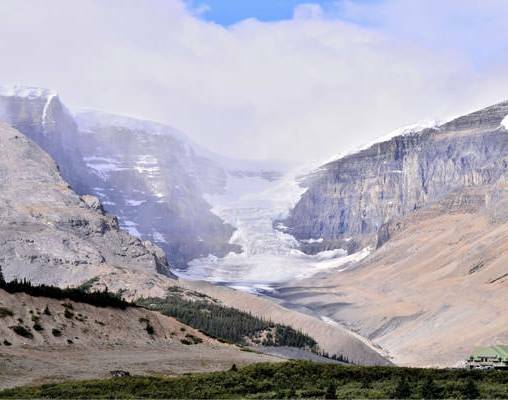 At the heart of the Parkway is the Columbia Icefields, and from here you will set out for Athabasca Glacier, where you will embark on a Glacier Adventure Tour. You will board a massive Ice Explorer and set out onto the ice for an up-close look at the power of nature. On the Glacier, you can touch the glacial ice, drink the pure water and even set out for a walk above the cliffside on the glass-floored Glacier Skywalk. As you return to your car, you will continue on to Lake Louise, at which time you will check into the Fairmont Chateau Lake Louise - a stunning lodge overlooking famous Lake Louise and the surrounding mountains. You will have the rest of the day to enjoy the picturesque surroundings. Overnight Lake Louise. Make your way from Lake Louise to Banff today. Take as much or as little time as you desire to make the drive; head straight there, or take the scenic route, stopping at fantastic destinations along the way. Highlights include Cave and Basin National Historic Site, Johnston Canyon and its waterfalls and Castle Mountain. As you arrive in Banff, check into your hotel, the Rimrock Resort, and set out for a day of adventures. This hotel is located within walking distance of some of the best things Banff has to offer, such as the hot springs and Banff Gondola, and just a short drive from the shops and restaurants in town. You can also enjoy outdoor sports, hiking and adventures in the national park. Overnight Banff. Travel through the lush landscape of Banff National Park on your Discover Grizzly Bears Tour today. You will learn about the powerful bears in the region, as well as about their diets and seasonal behaviors. 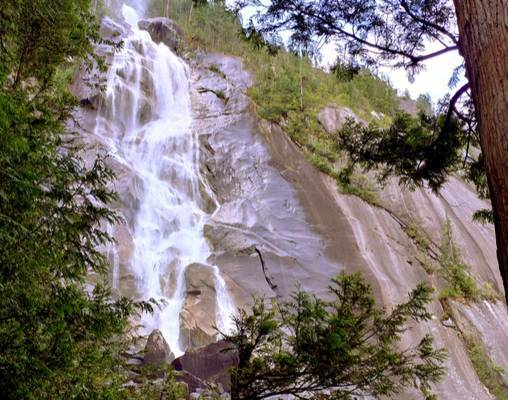 During the tour, you will also visit Takakkaw Falls - the second highest waterfall in Canada. Following this outing, you will have the remainder of the evening to soak in the breathtaking beauty of the Canadian Rockies and Banff. Whether you choose to explore the natural or the commercial side of Banff, you have plenty of opportunities for adventure. Overnight Banff. Make your way out of the mountains and into the city as you head to Calgary International Airport to return your rental car and board your flight home. *Select travel dates will include a guided 7-hour boat and land tour through the Khutzymateen Valley for grizzly bear viewing. Hotel accommodations include the Fairmont Waterfront, Vancouver, Kwa'Lilas Hotel, Port Hardy, Crest Hotel, Prince Rupert, Coast Inn of the North, Prince George, Fairmont Jasper Park Lodge, Jasper, Fairmont Chateau Lake Louise, Lake Louise, and Rimrock Resort, Banff. Sit back in a roomy seat and take in the spectacular scenery that flies by through the large windows in our train cars. Checked baggage service is included. Light meals, snacks and drinks are available for purchase. Enjoy an unobstructed view in the Panorama Dome car while eating a delicious hot meal offered on board. Checked baggage service is included. *Level of service onboard VIA Rail will vary depending on departure date. Discounts Available for select dates between 1st March 2019 and 31st December 2019! Prices in the table below reflect the current promotion. Please enter discount code CAN19 at checkout to ensure you receive the price reduction. Enter your details below if you would like to be notified when 2020 dates and prices are available for Western Canada & Rockies Wildlife Adventure. Prices are correct at the time of publication, however are subject to change at time of booking. Hotel and Rail accommodations listed above, are subject to change based on availability at the time of booking. Prices are per person based on double occupancy. Taxes on rail portions are not included and are subject to change. 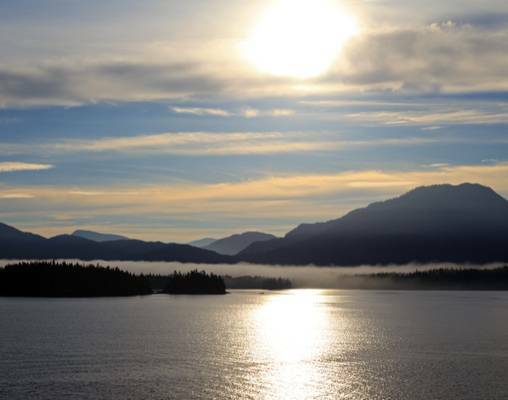 All accommodations in Port Hardy, Prince Rupert & Prince George are of moderate standard.